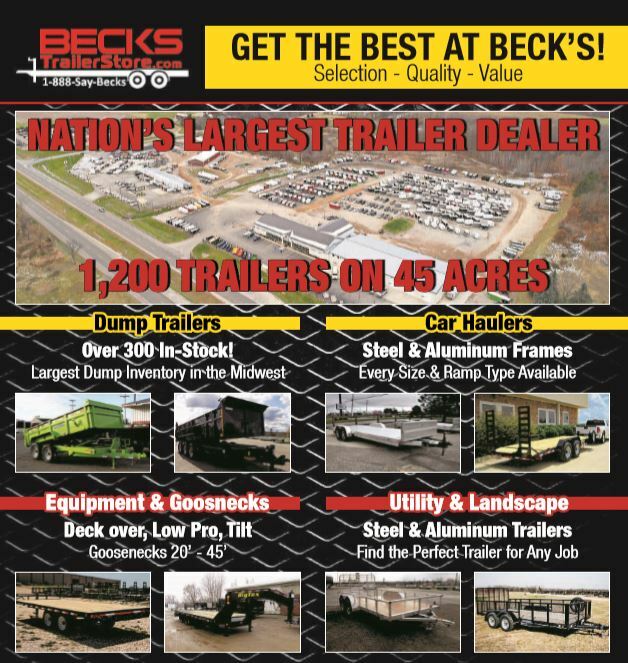 Specials | Beck's Trailer Store | Michigan's Largest Trailer Dealer | New And Used Trailers For Sale And Rent. Welcome to our Advertised Trailer sale page. As the nation's largest trailer dealer, we use our buying power to save you money on quality trailers from top rated manufacturers. This week we have savings on every type of trailer including ATV/UTV, cargo, utility, gooseneck, dump, and snowmobile trailers with Winter clearance pricing. Financing is available even on clearance priced trailers. You don't have to settle for a "cheap trailer for sale" just to stay in budget. Use our mega buying power to get the absolute highest quality trailers for a better price. CLICK HERE for additional trailers. Call us now and one of our trailer experts will help you find the trailer that best fits your needs & your budget. If you'd like to keep your cash, then take advantage of Becks Easy Trailer Financing Approval. Right now we have the lowest payments in the industry on all trailers for sale. You can finance your trailer for as little as $69 dollars a month, and keep that hard earned money in your pocket. Go here to get pre-approved for trailer finacing. You can call us at (844) 820-7107. We're here Monday-Friday 8am - 6pm and Saturday 8am - 3pm close of business (last customer served). 100's of trailers will be purchased this week during this sale and it is very difficult to update inventory in real time. For this reason, PLEASE come in at your earliest convenience or call a trailer specialist at (844) 820-7107.